At VentureSail, all our voyages are different to the next. However, one thing they all have in common is that they are all loved by solo travellers. Discover what one Bessie Ellen passenger thought of her journey from Tenerife, in the Canary Islands, back to Cornwall. ‘When joining 1904 trading ketch Bessie Ellen on her ocean crossing from the Canary Islands to Cornwall, I deliberately didn’t invite any friends or family. I wanted it to be “my thing”, that I knew I would enjoy and I didn’t want to concern myself with whether they were having as good a time as me. But, as to be expected, there is a definite amount of uncertainty and anxiety about committing to a holiday that holds a few unknown factors, like a sailing trip – and this is magnified slightly by the thought of being totally absent of familiar faces. However, once underway we are encapsulated in our own world, and all worries evaporate. Is there space for privacy? What will the bathroom facilities be? Will I get on with the other guests? These are all natural queries and concerns before embarking on a voyage at sea, and despite being more than happy to travel alone, it can be comforting to share the experience with others. Fortunately (and, as I would later learn, not unusually), I had nothing to worry about. The rest of the guests consisted of mainly singles or couples, with a few seasoned sailors on Bessie Ellen – a sure sign of an excellent experience. One of the things you don’t consider before leaving is how much the other guests will add to your experience. There are people from all walks of life, backgrounds and cultures on board, and to have them share their breadth of life experiences and stories makes for such interesting, diverse discussions that will broaden your own outlook and opinion on a range of different things! On a slightly different note – the bathroom facilities are much better than I was expecting for a sailing vessel. They are large and spacious, with plenty of room to shower and change without getting everything wet. The food on board was of professional standards. Bessie Ellen has a galley equipped so well that the meals we ate were incredible – pork that had been slow-cooked for 12 hours, fresh seafood from local markets, and more cake than you could imagine. Bessie Ellen carries two generators that give the boat the same amount of power as a normal household, so there’s plenty of electricity for charging all manner of portable devices – most importantly cameras! The generators aren’t running all day, but there are enough power sockets for everyone on board, but make sure you remember to bring UK plug adaptors. The other thing that many people are concerned about is about getting enough “me time”. The idea of being on a ship (even a fairly large one) conjures up images of cabin fever – but have no fear. Alone time can be plentiful on board if you wish. Bunks are spacious, so you can bed down with a book or just some peace and quiet, but the boat is large enough that there is always somewhere you can relax. Take advantage of the large on-board library that of course feature plenty of maritime literature as well as novels and even a few rare editions. The ability to relax is also due to the fact that it’s up to you how much you get involved. Get stuck in and learn as much as you can take on board, or just grasp the basics and instead revel in the feeling of being surrounded by wildlife and the steady, comforting rocking of the waves. 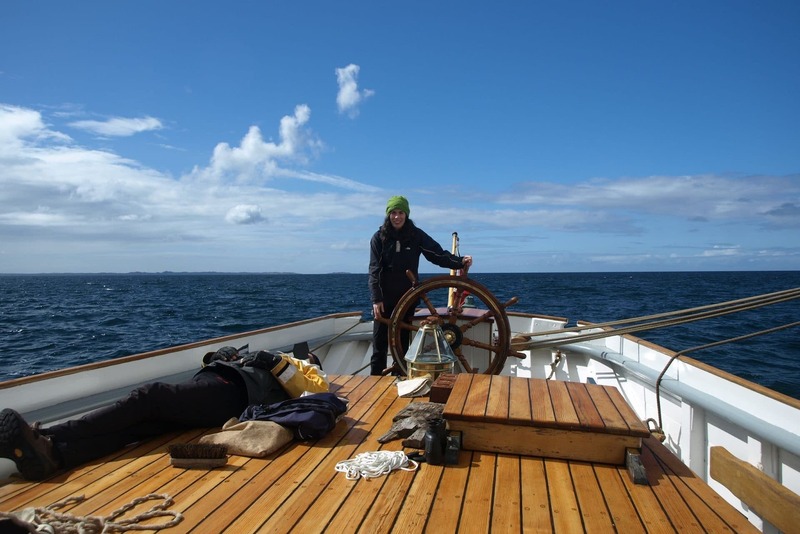 For Bessie Ellen, skipper Nikki hand picks all the routes and destinations based on the extensive knowledge that she has gained after many years sailing the areas. This means you will definitely get the best views, the best wildlife, and best ports possible – there’s no trial and error on these voyages. Having said this, if you have somewhere that you want to visit, it’s simply a case of mentioning it to the crew who will then try their absolute best to make it happen.